Today marks the 151st anniversary of Abraham Lincoln nominating Ulysses S. Grant for promotion to lieutenant general, which he would earn on March 3, 1864, and appointing him to command of all Union armies, replacing Henry Halleck, who caused Grant problems earlier in the war, while his (Grant’s) commander in the West. This promotion was significant in two key ways. First, Grant’s promotion made him the first person to be commissioned lieutenant general in the Army since George Washington, though Winfield Scott held the rank under a brevet commission. Up to this point, no one had equaled Washington in seniority in the Army in terms of rank. Second, this represented the pinnacle for Grant’s military career. While he later went on to earn a fourth star, serving as General of the Army under Andrew Johnson from 1866-68, Grant, at the end of the war, commanded an army of around 600,000 soldiers, equivalent to Napoleon’s Grande Armee. The army he led was arguably the best equipped and trained fighting force in the world at that point. The meteoric rise of Grant’s career from colonel of the 21st Illinois Volunteer Infantry to General-in-Chief is a testament to his perseverance, having been regarded by superiors and critics early in the war as a drunk (Grant had a drinking problem due to loneliness in the pre-war frontier army and had resigned in 1854) and later war critics as an uncaring butcher. Though his presidency is not regarded too highly, Grant remains one of our nation’s greatest generals. 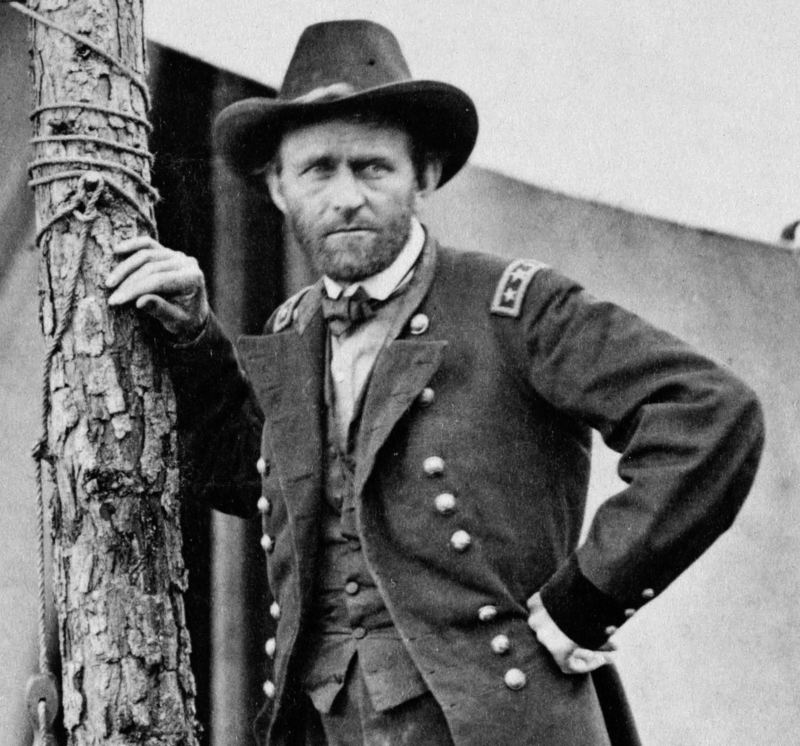 While Washington is first in my heart among our nation’s military leaders as the first commanding general of the U.S. Army, Grant is one of my favorites because of his tenacity and his connections to Illinois. Lincoln trusted Grant and that trust was earned through several key victories, while other generals of Union armies were losing. Grant understood the harsh realities of the war and prosecuted it to the best of his abilities and to a successful conclusion for the Union. All in all, well done, General Grant, well done. Brady portrait of Grant at Cold Harbor. This entry was posted in 150th anniversary, Union Army and tagged General, Grant, lieutenant general, Lt Gen, Ulysses Grant, Ulysses S. Grant, Union, Union Army by Daniel Sauerwein. Bookmark the permalink. I think that without Grant and Sherman, the North would not have won the war. I admire them both very much. I know that a lot of blood was shed, but they probably saved more people by their “all out war tactics” during the March to the Sea.